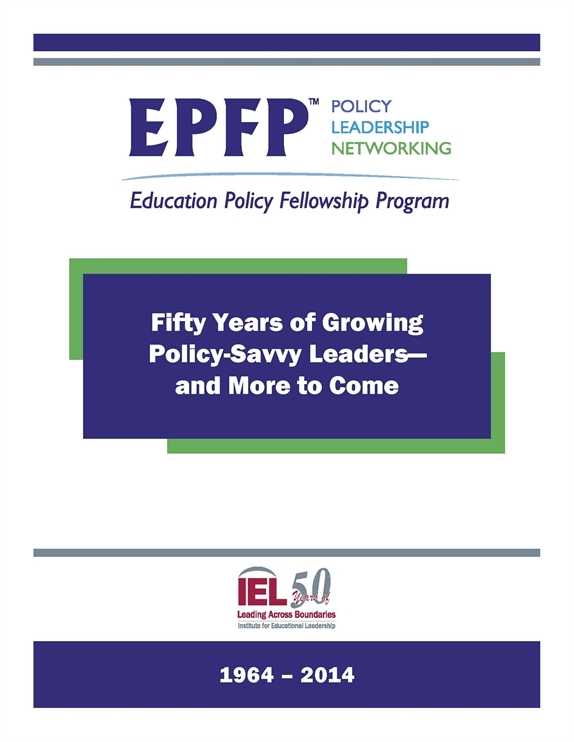 The Education Policy Fellowship Program (EPFP) has evolved over time since its creation in 1964 with funding from the Ford Foundation. The program began as a response to the explosive growth of the federal government’s role in education as a result of the enactment of the Elementary and Secondary Education Act (ESEA) and related legislation. The transformed role of the federal government generated a need for education professionals in the states who understood the content of legislation, the policy process, and the complex changes that state systems were undergoing as a result. Today, many things have changed, but this need has only grown. EPFP is based on the premise that the presence of productive workers at all levels is the hallmark of any excellent organization, and this is especially and increasingly the case in the field of education and related sectors, such as workforce development, health, and social services. Professionals in these sectors must know how to work effectively in a political and strategic environment, and to do this they need skills and perspectives above and beyond those that they can acquire in the usual, tightly-focused professional development programs. The growth during the 1980s of the states’ policy role in education enlarged the field and began to raise the stakes for people concerned with public education in the United States. School systems, associations, universities, local governments, and private firms with an interest in public policy and the public good realized that they required leaders and staff members who understand state policy cultures, appreciate the nature of policymaking and the dynamics of policy implementation, and have the ability to represent their organizations’ interests in a complex and competitive environment. The leaders and employees of these entities also must be able to call upon a network of professional connections that spans the sectors of American life with an eye toward bringing added value to their organizations. Today’s education policymaking environment, with an intensified role for the federal government, has upped the ante. The press for universal student success and accountability in education have only added urgency to the development of sophisticated, broad-minded, and well-networked leaders in education. Learn more about EPFP's evidence of success in an in-depth, multi-part study funded by the Lumina Foundation. IEL hosted a celebration commemorating EPFP and IEL's 50th anniversary on Tuesday, April 29, 2014 in Washington, DC. The celebration included an unveiling of top leadership lessons IEL collected from its vast networks. The guests were treated to a performance by the Capitol Steps. View photos from the celebration. Since 1964, IEL’s programs have helped define national and state policies in education and workforce development, enabled leaders to build collaborative strategies that get results, and assisted practitioners to implement best practices, leading to better outcomes for our young people. To learn more about IEL's mission and work, please click here.